Sunday, April 7 | 2:00 – 3:00 p.m.
Wednesday, April 10 | 2:00 – 3:00 p.m.
RSVP: Jeff Cosgrove-Cook (jcook3@bowdoin.edu) before April 5. Space is limited. 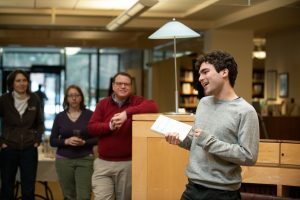 On Friday, February 8th, the Library celebrated ten years of the Bowdoin Reads project, the feature on the Library homepage showcasing what the Bowdoin community is reading. 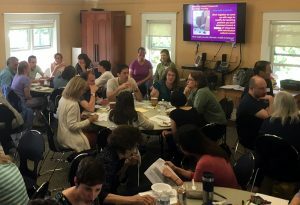 Begun a little over ten years ago (officially August, 2008), the site has featured over two hundred readers since its inception, rotating faculty, staff, and student readers monthly. 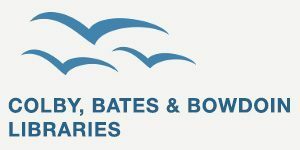 In 2017, we expanded Bowdoin Reads to include watching and listening. To help us celebrate, we invited some recent past participants to talk about and read from a chosen book. Eduardo Pazos Palma, Director of Religious and Spiritual Life read from Flourishing : Why we need religion in a globalized world, by Miroslav Volf; Michael Friedland, ’21 read from Who Will Run the Frog Hospital? by Lorrie Moore; and Osterweis Associate Professor of German, Jill Smith, read from What I Saw by Joseph Roth. We all enjoyed a fabulous book-shaped cake from the Union Street Bakery. What has Bowdoin been reading all these years? We’ve provided a list of books (and a few audio/video titles) which you can also find on the Bowdoin Reads Goodreads site. Contact Joan Campbell if you, too, would like to participate in Bowdoin Reads|Watches|Listens. 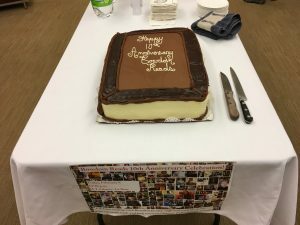 See also the story about the celebration written by Assistant Director of Communications for News Content, Rebecca Goldfine. Stay up to date with new acquisitions with the CBB New Books and Media search tool, http://www.cbbnet.org/new-books-and-media/, accessible from the library homepage (under Quick Links), or from within CBBcat (from the “search” dropdown menu at the top of all CBBcat pages). The CBB New Books and Media search tool is updated on a weekly basis. Use this service to generate a list of materials recently acquired by Colby, Bates, and Bowdoin libraries or to subscribe to an ongoing feed. Search by format for books, e-books, DVDs, audio books, CDs, scores, and government documents. Search on a particular subject area (books, e-books, DVDs only). Limit results by language and library location (Colby, Bates, or Bowdoin). Choose a time frame: most recent 7, 30, or 90 days. View results as a web page (full-featured or printer-friendly), or send in an email. Subscribe to a periodic email of new acquisitions. Choose subject areas of interest, format, languages, and location. Indicate the desired time period (whether items have been received in the past week, month, or 90 days) and set your preferred display option. Enter your email address, choose “subscribe,” and submit the form. You will periodically receive a list of all items acquired based on your chosen criteria. You can create multiple feeds and unsubscribe at any time using the link that appears on the subscription email. The CBB libraries continue to consider ways to enhance access to our shared library collection, and we hope you will take advantage of the New Books and Media search tool to keep up to date with new acquisitions. 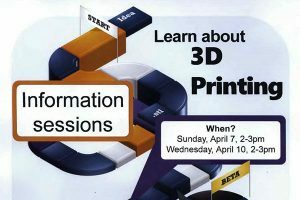 If you have questions, or feedback you’d like to share, please contact Karl Fattig or your Research Librarian. 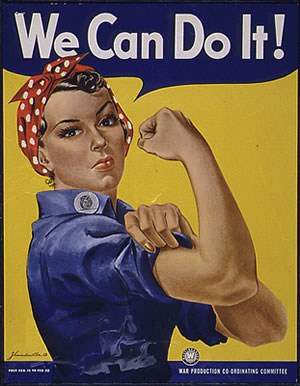 The Library has access to many electronic primary and secondary resources for research on women’s history. Here are some noteworthy sources. Be sure to Ask Us for more! 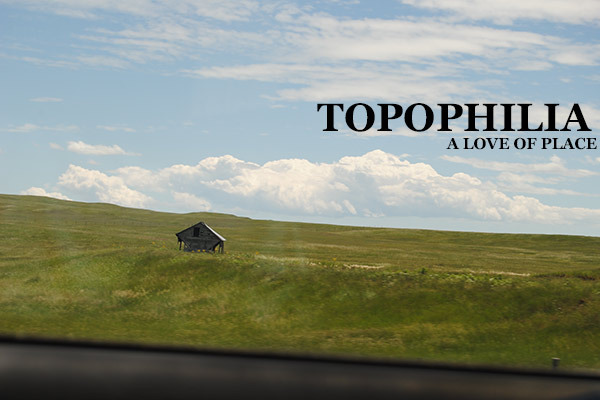 Please join us for the opening of The Ramp Gallery’s spring exhibit: Topophilia: A Love of Place. Opening remarks at 2pm on Friday, February 22. The Ramp Gallery is located in Hawthorne-Longfellow Library, basement level. Curated by Blanche Froelich, ’19, the Ramp Gallery features student art work from all four class years. 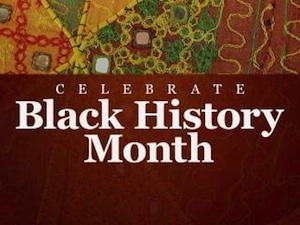 The Library provides access to a fabulous selection of online primary and secondary resources for research on African American history– take a look! Wednesday, March 6, 3:00 – 4:00 p.m.
Tuesday, April 2, 10:00 – 11:00 a.m.
Tuesday, March 5, 3:00 – 4:00 p.m.
Thursday, April 4, 9:00 – 10:00 a.m.
Wednesday, March 6, 2:00 – 3:00 p.m.
Friday, March 29, 12:00 – 1:00 p.m.
All workshops take place in the ECR, basement H-L Library. Just drop in – sign up not required. 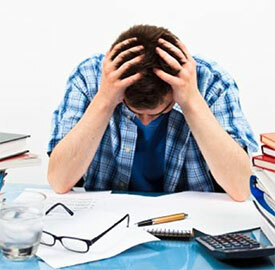 Have research to do over break? Most of the Library’s databases can be accessed anywhere in the world with your Bowdoin ID. Just use our A-Z list of databases and you’ll be prompted with a login screen where you enter your Bowdoin credentials. The Library will offer nightly coffee and snacks during Reading Period and Final Exams.